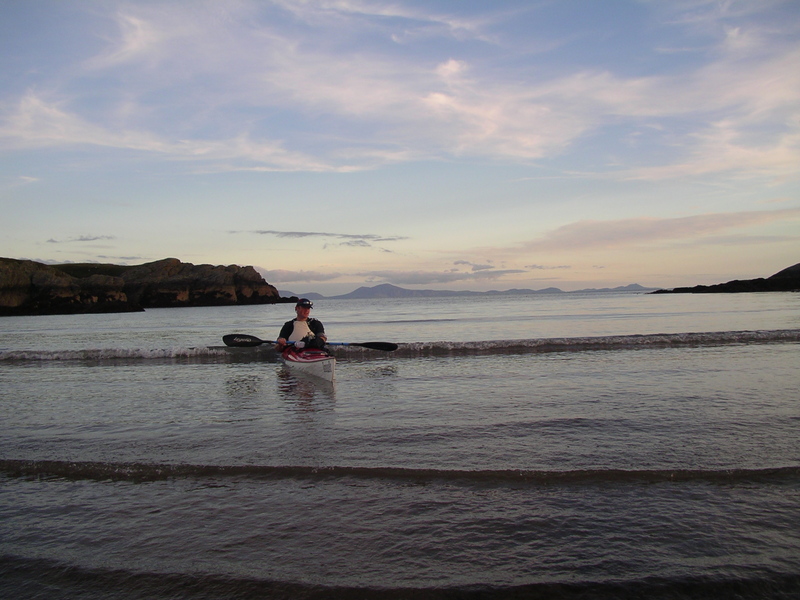 To me the fast circumnavigation of Anglesey by sea kayak seemed an obvious challenge. It was an achievable though testing goal that would involve a good deal of planning and preparation along with a little bit of brawn. My appetite had been wetted by Terry Storry’s tales of paddlers cutting short record breaking attempts in order to appease the better half, and more latterly, from reading reports from Justine Curgenven, Fiona Whitehead and Barry Shaw of their successful attempts. My aim was to set a new record for the time taken. With a bit of luck I believed that a sub-12 hour time was possible and if things went well a time around 11 hours and 30 mins would be nice. I believed Barry Shaw had the previous best with 13 hours 36 mins so I hoped to shave a little off this if things went to plan! The planning was crucial; to circumnavigate the whole island in this sort of time needed some sneaky tidal planning and would leave a couple of crux points where arriving too late (or even too early in some cases) would result in a time and energy wasting slog against the tide. Even so it was inevitable I would paddle against the flow in places, it was just a case of picking the best places! To achieve a fast time I would need good weather and good tides. I had learnt previously that conditions had to be spot on or it would all just be a waste of time. Trying to get the right weather and sea conditions, combined with a large spring tide and time off work was surprisingly difficult. There where not many days in the year that would meet all the criteria; this attempt would be the last chance for 2005 and probably for the next 6 months. Unfortunately, with days to go the weather forecast was not good; 20 mph+ winds would make it all pointless. So instead I packed the car and headed north to take part in Pete Roscoe’s excellent SeaQuest race. Returning after the race, the forecast showed a one day window of reasonable (though not ideal) weather had appeared, sandwiched between two windy days. So, at the last minute it was all on again. An added complication was my ‘independent timekeeper’ backing out as the early start became clear. My long suffering girlfriend Pascale would have to be roped in to press the button instead. And so I found myself, before daylight, getting ready on the beach. Pascale arrived, after staying in duvet land for a little longer, to help me carry the boat down and see me off. As per normal I had taken too long packing my kit and, as per normal, I was late starting. Finally, it was just a case of pointing in the right direction and starting the watches. I was taking no chances on the timing and so there were more watches involved than you would find in a Geneva Jewellers. I had left the beach 20 mins late, but knowing how I work I had allowed a 30 min buffer just in case. Now though that was effectively gone, not ideal. My long list of waypoints and timings lay accusingly in front of me. The schedule was tight and there were a few crux points that I had to make or I could have problems. I paddled rather sleepily out of the bay, into an annoying and chilly 10 knot north-westerly headwind. It was overcast and the sea was still disappointingly choppy from the previous day, not quite the oily calm conditions I had been dreaming of! Nothing much to get excited about normally but today I didn’t want to commit myself to 12 hours in the boat if the conditions would make it all pointless. As I neared Penrhyn Mawr I still had doubts that the conditions where good enough to make a fast time feasible. The headland was my ‘cut-off’ point, having turned there on a previous attempt. But before I knew it I bounced through the early forming tide-race, I was committed now. Keeping a good distance off-shore to use the tide, I had a great view of South Stack Lighthouse. It sat there looking a little aloof in the early morning light, bracing itself for the daily sightseers that would besiege it later in the morning. I had opted to wear a lightweight top rather than a heavy cag, and was hoping to sneak through the South Stack tide race without getting too wet. Unfortunately, the tide race had different ideas and the final wave dumped on me, leaving me sodden. Best part of 11 hours to go and already I had salt water in my shorts – nice! At least the headwind was now a steady breeze on the beam which made things easier. As I left the impressive cliffs of Gogarth Bay behind me the first crux point loomed. I had to cross Holyhead Bay between the Irish ferries sailing to and fro from Holyhead. Crossing Holyhead Bay in a sea kayak is always a slightly nerve-wracking venture. The ferries do not take prisoners and have left numerous sea paddlers with a few extra grey hairs over the years! First, I checked to see that there was nothing sneaking over the horizon from the west and whilst keeping a good eye on the Holyhead Breakwater I aimed for Langdon Ridge. I heaved a sigh of relief as the shipping lane fell behind. Pleasingly, I had been slightly ahead of time as I passed the Breakwater. Next, I headed for Carmel Gap which separates the Skerries from Anglesey; here the tide would pick up and so I should soon be flying along the North Coast. But as I closed on the Skerries I realised my drink bottle had become detached and was lost somewhere in the bilges! Try as I might I couldn’t retrieve it, I would have to land – bugger! The tide was picking up now and I had made my decision too late for the western end of the Skerries and so I had to pick up the pace a little to make the easterly end. After a rather comical landing on the rocks I retrieved the wayward bottle; I also took the opportunity to change my clothes. I was starting to feel the chill and needed to dry out a little. The tide was flowing impressively past the Skerries now and soon I was making nearly 10 kts, I had quite a bit of time to make up now. As I passed West Mouse, the brooding hulk of Wylfa nuclear power station loomed, sited, rather incongruously, next to the nature reserve at Cemlyn Bay. Though the wind had eased a little, I was having a little trouble getting the boat to run smoothly through the confused combination of swell, chop and tide race. The large spring tide seemed to have brought too much energy to the North Coast; the sea seemed to be in a boisterous mood! Beyond Cemaes Bay, the last of the summers Guillemots rose from Middle Mouse, they flew out to circle me twice before returning to the Mouse. The tide was easing a little now as I passed the brickworks at Porth Wen, the venue for many a sea kayaker’s overnight bivvi stop. Further along the coast came East Mouse and then the narrow port of Amlwch, along with the unsightly discharge pipe from the Parys Mountain mine workings. Rounding Point Lynas, with its low-slung, early 19th century lighthouse, I stayed a little offshore to avoid the eddy behind the headland. The unplanned stop at the Skerries meant I was now 15 mins down, I had some work to do on this next leg! Beyond the point paddling became much easier as the conditions improved. There was none of the chop of the north coast and I was sheltered from the wind here. Looking into the distance I could just make out my next destination, Puffin Island, just a depressingly faint smudge on the horizon. The east coast was going to be a long slog, I would be 2-3 miles off the coast for most of it, and so there would not be a great deal to look at. As I progressed the wind eased and the sun appeared to make life more pleasant. Off Red Wharf Bay I paddled alongside a LNG tanker, flying the French flag, at anchor. A quick ‘Bonjour’ and then onwards to Puffin and into the Menai Straits. Nearing Puffin Sound I could here the familiar sound of the fog bell on the Trywn Du lighthouse; soon I would enter the Straits and head west. The Menai Straits would be the real crux of the whole affair. The complicated tidal flows here would see me paddling both with and against the tides for a time. Obviously, I wanted to minimise the ‘against’ bit and maximise the ‘with’ bit! I had tried to make up a little time along the east coast leg but to no avail. I arrived at Puffin Sound still 15 mins down. There was enough water for me to ignore the ‘No Passage Landward’ warning on Trwyn Du light as I sneaked around the corner into the Straits; no time to visit the seals today. As I rounded the corner the clear weather gave me a spectacular view of the Snowdonia mountains in the distance, just topped with clouds. My late arrival in the Straits meant the flow was against me and stronger than I had hoped for; this was not good. But a little sneaky use of the coastline soon had me over the slack water bubble and then I gained the help of the west going ebb. Soon I was passing the historic castle and impressive sea front of Beaumaris. A stiffening breeze was blowing up the Straits into my face making things a little choppy as I neared Bangor Pier. From here it was only a few minutes to Menai Bridge, where the slipway was to be the venue for a scheduled and much anticipated lunch-stop. After so long in the boat it was bliss to stretch my legs and change into some dry clothes. Pascale met me on the slipway with some food and a very welcome hot flask. I was in no hurry to get back into the boat but all too soon it was time to head off towards Caernarfon. The tide was running well now as I paddled under Thomas Telford’s impressive suspension bridge and into The Swellies. I couldn’t resist a quick surf of the Cardinal wave, but onwards…the clock was still ticking. As I paddled beneath Stephenson’s Brittania Bridge, leaving the shelter of The Swellies, I was again 15 mins down. Into the headwind past the old slate port of Port Dinorwic and then the chop started to pick up again as I neared Plas Menai, but at least the sun was out again. Caernarfon castle showed itself from behind the town and then I was heading for Abermenai Point. Through the narrows of the point and then I picked my way through Caernarfon Bar as the sky cleared and the wind finally dropped off. I put the Snowdonia mountains behind me now as I turned towards Llanddwyn Island. The tide gave me more help here than I expected and by the time I reached Llanddwyn I had made up a good chunk of time. The air was really clear now and Llanddwyn looked spectacular framed against the blue sky. 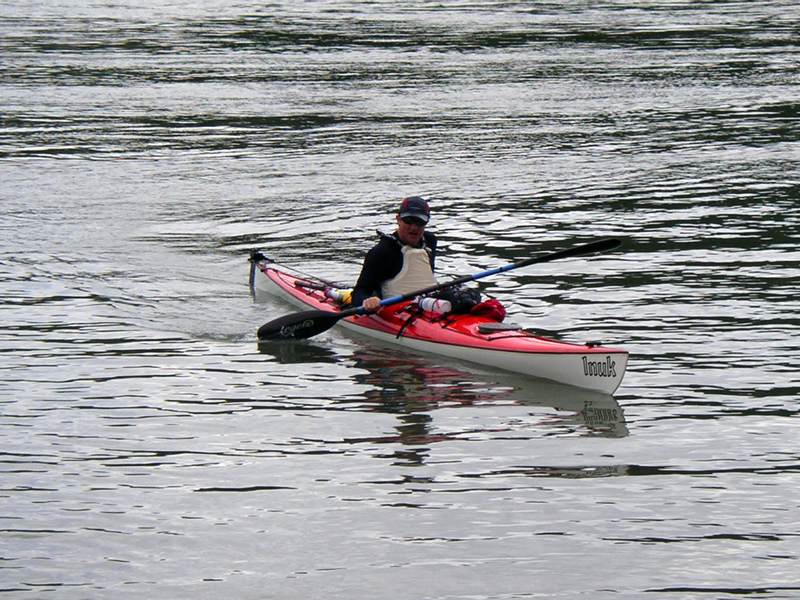 As I rounded the island I was preparing myself for the long slog up the west coast. The best I could hope for now was slack water but much of the time I would be working against a gentle tide. Decision time: to stay in close to the coast, to minimise the effects of the tide, or just straight line towards Rhoscolyn Beacon? A few calculations didn’t really prove a significant benefit either way. So it was down to gut feelings – straight line then. As per Puffin earlier in the day, the Beacon appeared as a grey lump on the horizon. I new that the time I had gained as I left the Straits would slowly ‘ebb’ (sorry!) away as I slogged my way north. With no help from the tide the GPS was constantly revising its ETA figure now, unfortunately not in my favour! It would be close, very close to make the 11hour 30 mins mark I was aiming for. It was time to pick up the pace. I mentally ticked off the landmarks as I made my way; Aberffraw first, then the island church of St Cwyfan’s, the sound of cars drifting over from the motor circuit at Ty Croes, followed by the white painted Rhosneigr and the airfield at RAF Valley. Eventually the finish loomed into sight, my shoulder was painful, my bum was numb and I was knackered! As I crossed the line a frantic session of button pressing ensued. The slowest time on the watches showed a time of 11 hours 30 mins (and 15 secs) – uncanny. The GPS had recorded a distance of 66 nm / 122 km – I had done it! It had been a long day. Of course there where no crowds or bands, only Pascale and myself on the beach. Then it was time for the anti-climax of loading the boat onto the car and heading home. Of course on the beach I said I would never do it again, ever.